While an impoverished graduate student in London, I was given two luxuries by my most beneficent uncle: a charge card to Fortnum and Mason and an account at the Mayfair bookshop Heywood Hill. I became instantly addicted to popping in and browsing through the stacks upon stacks of books. And if the ghosts of some of my favorite writers who were past patrons (including Osbert Sitwell and Nancy Mitford who actually worked here) weren't enough to enchant me, the extremely well-read and engaging staff made this no passing affair. Here are HH managing director Jeffrey Kerr's current recommendations - all of which look like must-reads to me! I urge you all to visit next time you are in London and, in general, to support your local bookstores which are going through tough times. Tom Loxley loses his dog whilst working on his book on Henry James out in the bush. His search takes him not only through the bush but through his memory, calling back his childhood in India and his early life in Australia. Yet his trip to the past is balanced by the sharp reality of his mother’s failing health and the mystery of Nelly. A beautifully crafted modern novel from Australia. A lavishly illustrated look at the work of David Mlinaric, one of the foremost interior designers of the last forty years. In addition to having taken over the mantle of adviser to the National Trust from John Fowler, David Mlinaric has worked on some of the most important historic projects in recent years: Waddesdon, Spencer House, the Royal Opera House, and the British Embassies in both Paris and Washington. The book also includes beautiful images of his own houses; Thorpe Hall in Suffolk, being particularly gorgeous with interiors of stunning simplicity and great elegance. Although at times sporadic, the Dowager Duchess of Devonshire and the travel writer Sir Patrick Leigh Fermor have exchanged hundreds of letters over the last 50 years. Charlotte Mosley has used her considerable judgement and skill to draw out some of the very finest of these, illustrating his devotion and her friendship. Paddy Leigh Fermor’s poetic travel writing, which immediately draws one to the place and event described, is perfectly balanced by the highly individual mode of expression of his correspondent. Light hearted and fun, a terrific read. Click here for an interview with Debo herself. A fascinating and beautifully written account of Adam Nicolson’s relationship with the place which is home to him, but which for many people is a national treasure, something to be preserved in aspic. This is a book about place, how it becomes a part of you: the history, the trees, the soil. 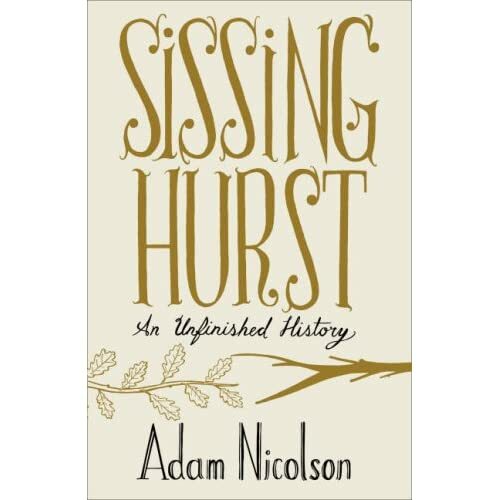 Nicolson weaves the story of his efforts to reconnect Sissinghurst with the surrounding landscape into the history of the place itself.